Our licensed professionals are standing by to respond to your requests and assist your needs as quickly as possible. Providing 24 Hour Emergency Service in Manhattan area with a 15-25 minute response time at the Upper East Side, Upper West side, Midtown, Murry Hill, Midtown, West Village and the rest of Manhattan neighborhoods. Locksmith Repair and Installation, Key Duplication, Intercom Systems, Buzzer Systems, Access Control, Wood, Metal & Glass Doors, and Gates for all residential and commercial locations. 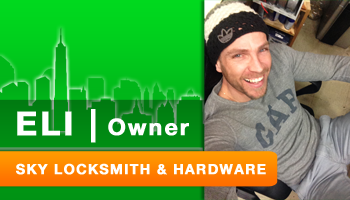 Sky Locksmith is a Google Verified Installer. Verification includes 3rd party verification of physical locksmith shop, machinery, tools, insured commercial vehicle and NYC DCA operation. Google provides additional guarantee when using Local Services. 3rd Party verification and DCA also includes criminal background check on installers. Some of the top quality products that we use are manufactured by: Medeco and Mul-T-Lock. Our Locksmith services and products sales include: Gates, Safes, Doors, Intercom, Alarms, and CCTV Access Control, Power Tool Rental, Handyman Service, Lamp Repair, FREE Air-Pump Service (bicycles).